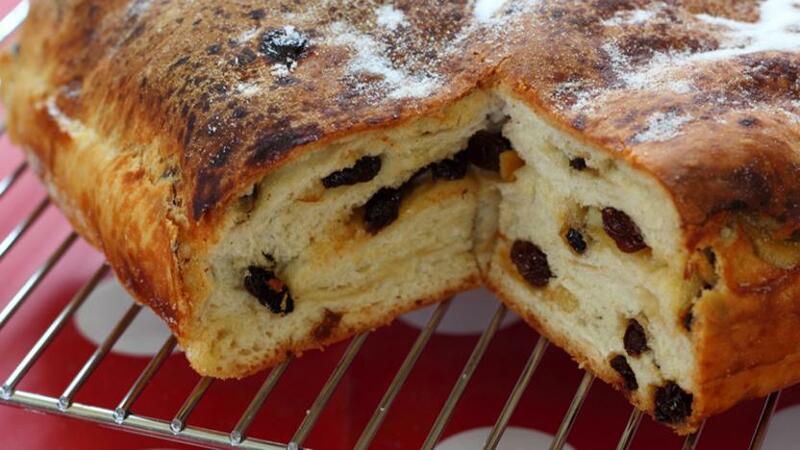 This recipe has a generous amount of dried fruit in a rich dough that’s lighter and less sweet than most shop-bought lardy cakes. Mix together the flour, salt and yeast in a mixing bowl. Rub in 20g/¾oz of the lard using your fingertips until there are no pieces of lard visible. Add three-quarters of the water and hand-mix the flour into the water to form a dough. Add as much of the remaining water as you need to get a dough that is soft and leaves the sides of the bowl clean. Tip the dough onto a lightly floured surface and knead for 5-10 minutes, or until the dough is smooth. Place in a clean bowl, cover and leave to rise until doubled in size. This depends on the temperature of the room, but should take 1-2 hours. Tip the dough onto a floured work surface and roll into a rectangle about 20x50cm/8x20in and about ½cm thick. Dot a third of the remaining lard and a third of the butter over the surface of the dough. Scatter over a third of the fruit and a third of the sugar. Fold the top third of the dough down and the bottom third up so that the dough is folded in three and roughly square. Turn the dough a quarter turn. Roll out and repeat the out process twice more, to use up all the lard and fruit. Line a 23x23cm/9x9in square loose bottomed tin with baking parchment. Roll out the dough to fit the tin and place it inside. Cover with clingfilm, or place inside a large plastic bag, and leave to rise for 30 minutes. Preheat the oven to 220C/425F/Gas 7. Bake for 30-35 minutes, or until golden-brown. Leave to cool slightly before removing from the tin. Cut into squares and serve warm or cold, with butter.